Now that we have imported our clips and set In and Out points, we’re ready to create our timelines or sequences of clips. As you would expect, Resolve gives us lots of different options to do this and while this can be done in the ‘Media’ page, one of the options is only available on the ‘Edit’ page, so we will move across to that. 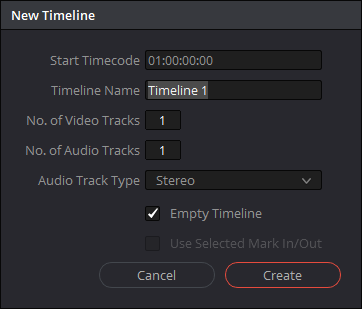 When on the ‘Edit’ page choose ‘File>New Timeline’ which brings up the following dialogue box. Firstly, if you want to change the start timecode for your timeline this can be done here (although if this is something you do often it would be better to change this elsewhere). Some TV playout systems require a start timecode other than 0 or 1 hour- for example, some older systems still use a start timecode of 10 hours!! Next, give your timeline a descriptive title as ‘Timeline 1’ etc. will be of little use in the longterm (we’ll look at organising timelines in a future blog). If you want you can specify more video and audio tracks at this point although it’s easy to add additional tracks later. If you know the audio type of your media this can be selected here although, again, this can be adapted later with addition tracks of different types added at any point. The ‘Empty Timeline’ button is an interesting one. If this is checked, then no clips are added. This is helpful if you wish to add a selection of clips to your new timeline that you are going to select in the order you wish to add them (which is hard to do any other way as the ‘sort order’ is the default way to add clips to a timeline at the point of timeline creation). But, if you uncheck ‘Empty Timeline’ all the clips in the selected bin will be added to the timeline in timecode order – which may not be very helpful. A useful keyboard shortcut at this point is ‘Shift + Z’ which zooms the timeline to fit the view (it’s a toggle that if used again will zoom back to the original zoom level). You can also use the slider at the top of the timeline panel. And, multiple hits of ‘Control/Command – and =’ to zoom into and out of the playhead. 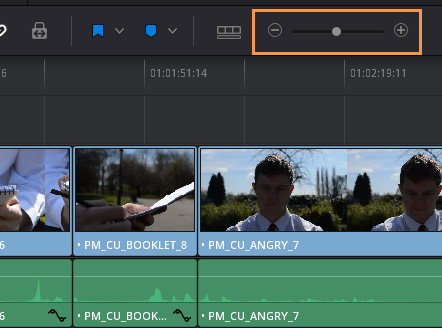 Another simple way to create a new timeline is to sort the clips in the order that you want by using the little sort options icon. Or in List View to sort the clips by clicking on the header of the column you wish to use – for example ‘File Name’ to list the clips by file name in ascending (or click again for descending) order and then select the clips you wish to add to your timeline and drag them across to the empty timeline panel. This will create a new timeline called ‘Timeline 1’ (so will need to be renamed) but the order will be in their sort order regardless of the order you select them. More timeline creation options in Part 2.